It seems like no time at all since our last dare-devil bloggers’ event at IFly Indoor Skydiving (time flies by when you’re having fun!) and we knew we’d have to pull out all the stops to make this time round just as memorable. With the arrival of warmer days (apparently, but we’ll get onto that later), we thought it’d be a good idea to move the party outside – and what could be more summery than a trip to the zoo! A firm favourite, our Tea with a Tiger afternoon lets guests get up close and personal with their favourite furry felines. Although ferocious in the wild, these big cats are pussycats in comparison, having been brought up around their attentive and loving keepers. The tour is a unique opportunity to gain an insight into the lives of these fascinating animals, with visitors learning all about their habits and habitats, as well as the park’s brilliant conservation efforts. 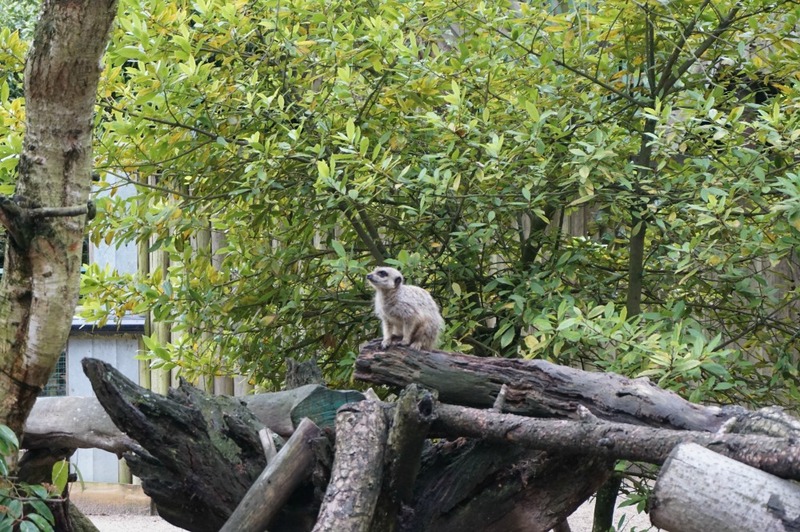 In fact, the park has since become The Zoological Society of Hertfordshire, a registered charity raising funds and supporting conservation projects both within the UK and globally. Afterwards, guests were let loose to indulge in a delectable afternoon tea (complete with delicate finger sandwiches, scrumptious cakes and homemade pastries) served in park Treetops Café – a bright and airy space overlooking the tiger enclosure! Sounds good right? We have a wealth of animal experiences to choose from – perfect for families or wildlife worshippers. We began the day with tea, coffee and mingling (as is tradition at most blogger events) in the Discovery Centre – a hub of activity, which is home to the biggest model lion we’ve ever seen… (only slightly less intimidating than the real thing!). Zoos have an inexplicable and mystical ability to coax out your inner-child, as you can see below (it was a photo op we just couldn’t pass up!). Before heading out, Tyler (Marketing Manager and all-round animal expert) explained more about the charity. What really stood out for us was just how much the staff care about their work. This isn’t a cliché or exaggeration – the amount of effort and dedication they put into caring for the animals is reflected in early morning starts and dusk finishes, arduous tasks completed with a smile (have you ever tried mucking out camels and staying cheerful?) and the intimate way they greet and talk to every visitor. Kind and considerate, they took time to address everyone’s questions and paid special attention to those with justified concerns about zoos. I have to admit I have mixed feelings about zoos. However, our guide did make me feel more comfortable about them. He explained that Paradise Wildlife Park was previously Broxbourne Zoo, which wasn’t the nicest of places with small cages. A new owner is turning this around and they are going through a process of building new enclosures and making it a nicer environment for the animals. Raring to go, our tour-guide Steve looked after us for most of the day. Bubbly, informative and enviably knowledgeable, he took us around the park and gave us a thorough talk on each animal. Despite the unusually gloomy weather (we picked the only rainy day in about a fortnight), his enthusiasm and Essex boy charm had everyone feeling surprisingly sprightly. However, he didn’t shy away from difficult questions; one of the most tear-jerking stories came when we met a gorgeous white tiger. White tigers are not a naturally occurring species and are mostly bred in captivity – this unusually beautiful big cat was rescued from a circus and now lives his life peacefully at the park as an ambassador for the species. We saw a myriad of interesting animals, from zebras and camels to tigers and penguins, and our talented bloggers managed to get some phenomenal shots. After all the walking and talking, it was time for a well-deserved cuppa and a slice of cake… or three! This had to be one of the most awe-inspiring parts of the tour – the café overlooked the tiger enclosure and it was a unique chance to get close the majestic cats. While it was slightly daunting to have a powerful predator mere metres away (at first we felt peculiarly like a finger sandwich), the tigers were very blase about the whole thing, yawning and lounging while we ate. Once everyone had their fair share of perfect pastries (our colleague Sophie even took some back in her pockets, they were THAT good), our bloggers collected their goodie bags and were free to explore the rest of the day. Create amazing memories for an animal lover who enjoys nothing more than being up close and personal with such wonderful creatures. Tea doesn’t have to be taken with a tiger, why not head over to our dedicated Afternoon Tea page to check the many other ways you can indulge in this great British institution.